There are many different car paint types and there are many pros and cons for each type. Your needs and the aspect you want to achieve determine the best type of paint. Certain types are easy to apply, while others can be more difficult. Some colors may be harmful and require special equipment and ventilation. You should look at the different types of colors, how they are applied, and the benefits they have. 1) Advantages of urethane paint for cars: Urethane paint is a great option as it can be sprayed on almost any type of paint as it does not react. This paint can even be sprayed on paint. Urethane paints are also very cheap and dry very quickly after application. Urethane paints last a long time and are very durable; They do not fade or splinter easily. Disadvantages of Urethane Car Paint: Although this type of paint is affordable, it is not the cheapest there is. While urethane paints are durable over time, they can sometimes look like plastic. You must wear suitable protective equipment as it is poisonous. When handling urethane paint, you must wear a suit, an air-operated respirator and safety goggles. Using a spray gun can be difficult as flow problems sometimes occur. 2) Advantages of Metallic Car Paint: Metallic paint offers a very cool paint effect, as it will make your car noticeable and looks great on sports and muscular cars. Metallic paint makes the car very attractive. 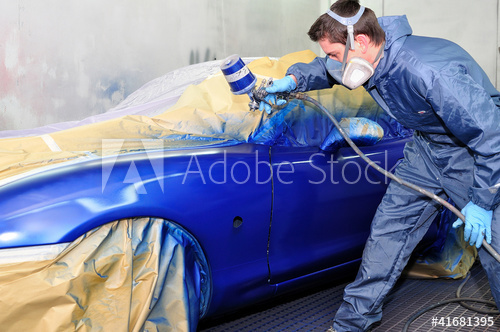 Many times a metal coat of paint can increase the resale value of your car. Metallic paints are a premium type of paint, and it can hide dents and scratches, because it is very reflective. Disadvantages of metallic automotive paint: while this paint can hide scratches, it can also make repair difficult. This paint is difficult to pick up if you need to fix any stains. You also do not have a large selection of colors, so if you are looking for a certain shade, you may have difficulties. It is also a very expensive type of automotive paint. 3) Advantages of acrylic paint for cars: this paint is very easy to apply and will give a very nice glossy surface. In particular, acrylic enamel paints give a hard shell when they are dried, and when used by professionals, they really bake them in the car. There is a single-stage acrylic paint and a two-step system that will require a superior clear coat. Disadvantages of automotive acrylic paints: while acrylic paints for enamel are one of the types of hardeners in car paints, acrylic paints for varnishes are not stored for a long time and are described as "soft". This paint fades and wears easily when exposed to ultraviolet light or chemicals. They can also be very difficult to apply to those who do themselves, the painters, and will have to do many finishing jobs. If you are using urethane acrylic paint, then when mixed, you should use it immediately. So you can decide which paint particularly satisfies your need.